Christmas can be one of the most stressful times of year for food safety in the home. Sure, everyone likes a bounteous Christmas dinner with all the trimmings, but for the poor person preparing, there’s a mountain of potential safety issues to deal with. One way to effectively prevent some of this and reduce Christmas cooking stress is by using your freezer to prepare ahead of time. On top of this, once the meal is over and your pile of leftover turkey stretches to the ceiling, freezing uneaten food can help prevent food waste, which at Christmas reaches epidemic levels. These are the messages that the FSA are keen to put forward through their new FSA Freezer Fairy campaign, and here we’ll give a summary of their tips, and add some of our own, to make sure you’re still eating turkey sandwiches in June (OK, maybe not quite that long)! A popularly held misconception is that food must be frozen on the day of purchase, whilst in reality it can actually be frozen up to its use-by date. Most food can be frozen, including your cooked meals, so feel free to freeze any uneaten Christmas fare. By carefully considering how many people you’ll be serving on Christmas Day, along with their dietary preferences, you can only buy as much food as necessary. This means that you won’t have to give your freezer as much of a workout, and can save money and potential food wastage. You can do all of your Christmas food shopping ahead of time, rather than in one big hit at Christmas, when supermarkets are heaving and seasonal products are in short supply. Not only can you buy all of your food ahead of time, but you can also prepare much of it and freeze it ready for Christmas, so that Christmas Day doesn’t turn into cooking chaos. This does take some foresight and planning, but can be well worth it. Take vegetables, for example, which can all be peeled and prepared in advance before defrosting on the day for simpler cooking. Make sure to wrap up any food that you freeze to protect it from the low temperatures and freezer burn. Write what’s frozen and when you froze it as well, so that you know exactly what’s in the freezer and what still needs preparing. 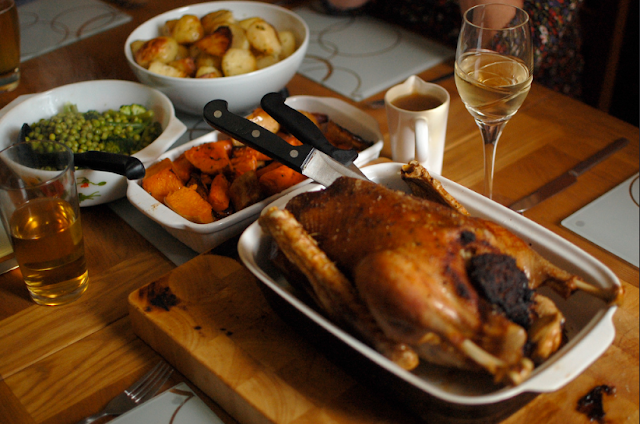 You could cook and prep your turkey ahead of Christmas Day to save on time and hassle. Simply roast the bird, let it cool, then slice and freeze. Then you can take the turkey out just when you need it. Alternatively, many people like to roast the turkey on Christmas Day itself, and if you fall into that camp, you can still freeze the whole turkey after you’ve bought it. Just be sure to leave plenty of time for the meat to defrost, as a large turkey of several kilos can take as much as 3 days to thaw in the fridge. Roughly, you should allow around 10-12 hours per kilogram of meat. Make sure you check that the turkey is properly defrosted and cooked. For a more detailed guide on properly cooking your bird, check our article here. If (or more likely when) you’ve got a load of festive leftovers, let them cool down and put them into the freezer as soon as possible, preferably within 1-2 hours. You can also cook the leftovers into new meals before freezing them. Make sure that when you use frozen leftovers, you defrost them thoroughly! Filo pastry - dries out very fast. Cream - texture can be affected. Cheese - not good if the cheese is to be eaten on its own. Acceptable for cooking. So there we have it, everything you need to start sorting out your freezing plan and Christmas menu, allowing you to avoid wasting food, money, or time. Let the festive freezing begin!